What's the secret to making bannock? 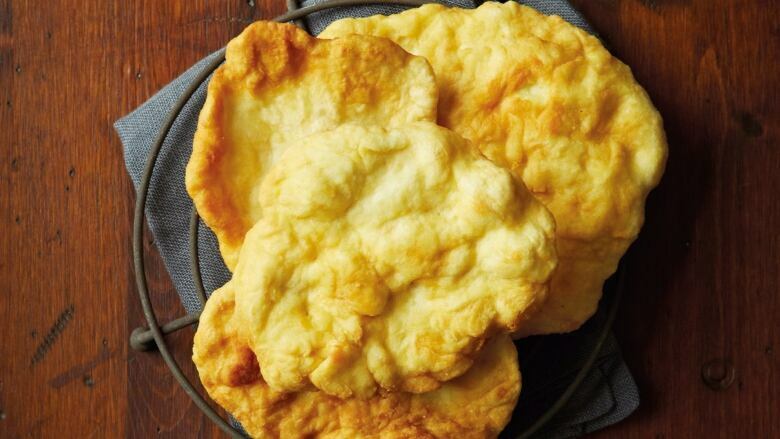 Caller Tony Whitford from Yellowknife, N.W.T., successfully made bannock after years of trying. The quick bread is a holiday staple in his family. Whitford told his story and offered up some helpful tips. PC: We're going out to the North West Territories to begin today, in Yellowknife, and that's where Tony Whitford is. Hey Tony? TW: Not, too bad, a little bit behind on my Christmas cards and all that. PC: Christmas cards? You are more than a little bit behind, you got two or three days. TW: Yeah, I'm getting ready to make some bannock for Christmas. PC: You're going to make bannock? First time you are trying this? TW: First time I'm going to be successful! I remember last year, I tried to get the recipe and tried to figure out what was wrong with my mix. My cousins came up from Fort Smith this fall to show me how personally... I am in my seventies now. Back in the day when we had lots of caribou, because my family comes from a hunting and trapping family, the hunters used to save the caribou tongues for Christmas. And of course ptarmigan and moose ribs and stuff and that's what we had. That was our favourite! Tongues were for celebratory occasions you see... And of course, bannock came with that and tea and cranberry jam that my grandmother used to make. You make it in the fall and it would last forever. It was very simple: boil cranberries with sugar and you put it in a jar and it lasts for a long time. PC: Last year you attempted and failed at making bannock? This year have you made it already? TW: Yes I did. And it turned out fine! It was about the sixth batch that I made this year to try and get it right. I think the ravens ate most of it, because one of the things I was doing was over-kneading it. Instead of just mixing it and knead[ing] it down with the palm of your hand, I was making it like bread. Squeezing it and ... You don't do that with bannock, you just put your flour and your sugar and your oil and your baking powder together and water and mix it good. Dry first, and then the water comes after. Then pat it down and make a round circle of it and cut it out with a cup or a glass and then you put them in the oven at 400 and its done! PC: Are you hosting dinner at yours? TW: Yes, yes I am. Smaller group this year, the kids are going to visit the other sides of the family this year, but with the number of Whitfords that are in Yellowknife we'll have about ten people. TW: And bannock is on the list as well as cranberry. We managed to get some cranberries this year. PC: Well, enjoy your feast Tony, thank you very much. TW: No caribou tongues though. TW: We're hoping to get a ptarmigan, so we'll make some ptarmigan soup out of that and we'll have an old time family dinner. Thank you very much and Merry Christmas to everyone that I know around the country. BS: That was actually a great point that he made about not over-kneading the bannock, because it's a quick bread basically and its like making biscuits, and you just have to be careful not to over handle it, because you think it's kind of "bready", and bread you knead and knead and knead and that's developing the gluten in the flour and letting the yeast come, but this is just a quick bread. So he's right!